This image, circa 1938-39, comes from the collection of a long time Berowra resident, Jim Hatfield. It shows Jim as a young boy, second from the right with some members of his family and a friend, on the far right. While the young woman and the girls and boys line up at the back of their house, the pet dog claims a spot in front of its kennel. The house which was rented from a Mr Warne, was located near present day Clinton Close. Two chimneys are shown, the one at the rear of the house was for the kitchen, the other was in a more central position on the side of the house and provided warmth for the main body of the building. Internal walls were made of corn sacks white washed with lime. You will be able to make out a couple of other houses in the vicinity. Such a different scene today! Self- sufficiency and improvisation were very important in those challenging times. The whole family, like most in Berowra, had plenty to do. The house was set in at least five acres of land. In the centre of this land was a gully which carried water after rain. Jim remembers an orchard of mainly stone fruit trees with a couple of citrus trees. Vegetables were grown and poultry were cared for, plus a few pigs, cows and calves to supply for the needs of the family. Meat was first eaten fresh and the remainder corned. It was stored along with dairy foods in a cool area under a water tank. 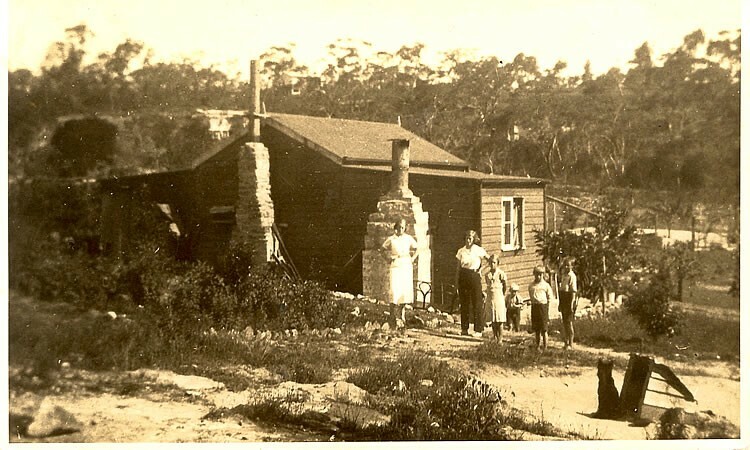 Imagine growing up in Berowra in the thirties and forties. Imagine the hard work and the carefree adventures of the five and their dog shown in this fine picture. We will have further stories to share. Maybe you have some of your own!